Louis Escobar puts on a fireworks display in Portsmouth each July 4th with the financial donations of the people of Portsmouth. This year Louis has offered to team with the 375th Celebration to make it the best fireworks display ever. FEED THE MILK CAN and ADD TO THE FIREWORKS DISPLAY. Did you know that the Portsmouth July 4th Fireworks is funded only by private donations? Each year the cost goes us and the donations fall short. Louis Escobar ends up making up the difference ot of his own pocket to ensure a great display. This year, in addition to the traditional "milk can" in front of Louis Escobar's home on Middle Road, the Portsmouth 375th Committee has made up two more cans. One is permanently at the DeCastro Farm Stand across from St. Barnabas Church on East Main Road. the other one, currently at the Portsmouth Library will be traveling around town. Please give what to can to help make the 375th fireworks the best ever. 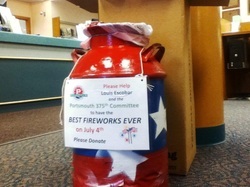 Drop a few bucks, or more, into the milk cans or send a check to "Portsmouth 375th Committee PO Box 971 Portsmouth RI 02871" marked "Fireworks".